Tillyard Management Inc. has an iPad Air Winner! Home/News/Tillyard Management Inc. has an iPad Air Winner! 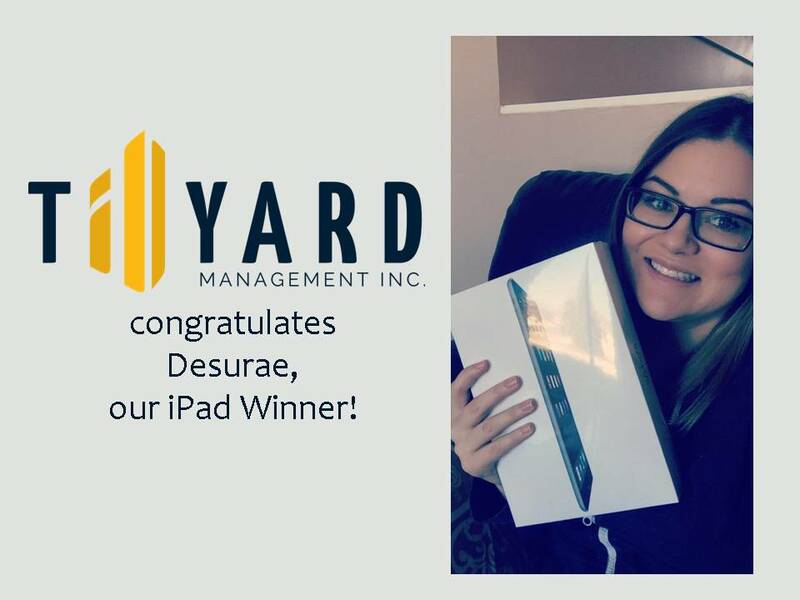 Tillyard Management Inc. is happy to announce that Desurae from Vegreville, Alberta, is our lucky iPad Air contest winner! Congratulations to Tillyard Management Inc.’s iPad Air winner, Desurae of Vegreville, Alberta! Desurae followed us on Twitter and Instagram and liked our Facebook post, boosting her chances of winning by entering three ways – well played, Desurae! She clearly knows how to use social media to her advantage, so we think the iPad has found a truly worthy home. No doubt Desurae will be using her new iPad Air while writing her blog. You, too, still have a chance to win something wonderful from Tillyard Management Inc. in the upcoming days, weeks or months. Keep following us to watch for our next contest – who knows what the prize will be – we sure don’t! But doesn’t that make it so much more exciting? Maybe a Tesla, a trip to someplace exotic, a puppy, or even another iPad – all these goodies are possible in the world wide webaway. Well, you can forget the puppy, if we’re going to be honest. Canada Post frowns at that. Tillyard Management Inc. thanks everybody who participated and we wish you better luck with the next draw!